Being a strong swimmer is an essential skill and one that many parents, especially those with pools, care about developing in their children. Swim lessons are important and swimming for a school or city swim team is beneficial too, but one of the best ways to promote strong swimming is by incorporating fun pool activities and games in your own backyard. Swimming games allow you to encourage your children to swim more and to strengthen their skills while having a blast. These games and activities are a great way to have fun in the summer while keeping your kids active in the water and improving their swimming. Swimming games such as Sharks and Minnows or diving games are great ways to encourage strong swimming patterns. Sharks and Minnows improves swimming speed and awareness in the water while dive games are extremely helpful for younger swimmers who are getting the hang of downward swimming and holding their breath underwater. 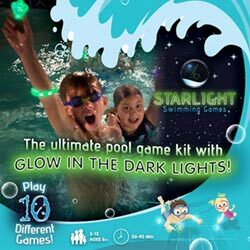 Starlight Swimming Games, a swimming pool game set of 10 different swimming games from Starlux Games, includes glow in the dark equipment for both of these and is a great way to keep the fun going after the sun goes down. It’s incredibly easy to set up, requires very little maintenance and is easy for kids of all ages to understand. Incorporating night swimming into your weekly summer routine is a fantastic way to strengthen swimmers in your family and is a new and fun twist on traditional pool activities. One of the big appeals about joining a swim team is the element of competition that is cultivated. A good way to keep kids engaged with activities is to promote healthy competition within the games or activities. 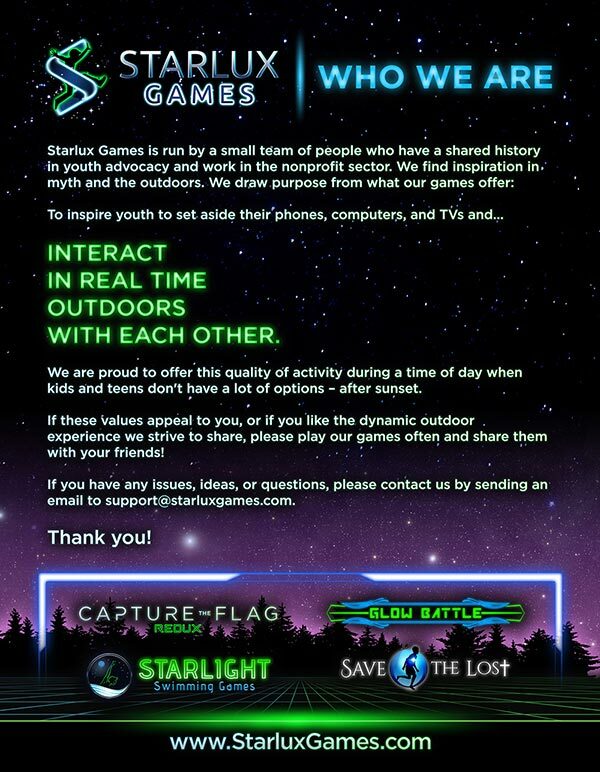 The Starlight Swimming Games can be used to play ten different types of games, many involving competition. Another great option which involves a different kind of swimming competition is the Watermelon Ball (available on amazon), which is made to look and feel like a real watermelon when filled with water. This ball can be dribbled like a basketball underwater and passed up to ten feet. It’s a great way to bring some fruity fun into swimming and can be used to play multiple games. The Watermelon Ball is perfect for a family with kids of different ages and lets the whole family play together. Promoting healthy competition with games like the Watermelon Ball or Starlight Swimming Games is a great way to encourage strong swimming habits while keeping pool time interesting and active for your kids. Looking for something closer to a traditional sport? Consider a poolside volleyball net or an inflatable basketball hoop. 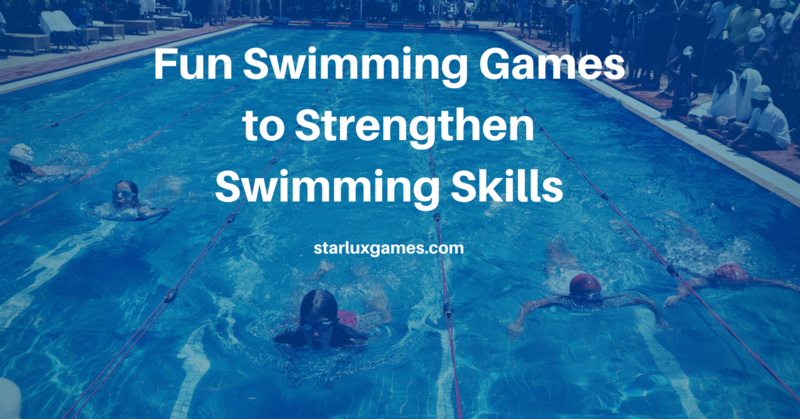 These kinds of games are perfect for older kids who are still looking to strengthen their swimming abilities. Especially with preteens and teens, one of the most difficult tasks can simply be to get them into the pool. By incorporating a sport that they already feel comfortable and confident with, you can ensure they get the pool time that they require to become strong swimmers. While these activities don’t necessarily encourage straight-line swimming like the games mentioned above, they can require treading water and general use of the same kinds of muscles needed to be a strong swimmer. Another advantage of group swimming games is that they are a good way to promote social interaction. This may not seem like the most obvious way to strengthen swimming, but using pool time as a social event is another good way to keep kids engaged and active. You should choose the group swimming games based on the number of swimmers and their ages. The Watermelon Ball, Starlight Swimming Games and pool volleyball or basketball are all great choices for social events. Games like these help encourage healthy social time and extended pool time which will help build muscle and encourage healthy swimming habits. There are also plenty of enjoyable pool games and activities that can promote strong swimming without any equipment. The popular pool game, Categories, helps to build swimming speed, timing and muscle. One person is “it” and names a category such as favorite colors or best desserts. They then proceed to call out items in the category. The remaining players line up on the wall and think of something within the category. When their choice is called out, they race to get to the other side of the pool before the “it” person can catch them. Another classic game is Marco Polo where one player closes their eyes and calls out “Marco” to which other players must reply “Polo” until the player who is “it” catches one of them. Games like this are fun and simple and can be used in between other games like those in the Starlight Swimming Games set to extend pool time. The most important aspect of swimming is to always encourage pool safety. Long stints in the pool can be a great thing for promoting strong swimming, but an adult should always be present and paying attention when children are swimming. This is extremely important for younger swimmers or swimmers just starting out and another reason why helping your kids to grow to become strong swimmers is so essential. The idea behind using fun games and activities to promote strong swimming is a simple one: keeping your child in the pool as long and as often as possible encourages muscle building and habit formation that will lead to strong swimming. To really endorse swimming, these activities are best supplemented with swim lessons, swim team, or some other kind of formal swim training. These games are effective however for getting your kids to feel more comfortable in the pool and more confident in their own abilities. They give them a fun break from traditional swimming that will continue to increase their love of being in the water. If you enjoy having pool parties, learn how to make your pool parties even more fun by reading our blog post on the best pool party games. The featured image used in this post is by CambodiaNisc on Wikipedia Commons and can be downloaded here.